In need of a good night’s sleep? Lavender, chamomile and clary sage essential oils are well known for their calming properties and many people drop these oils on their pillow to aid sleep. Here is a chance to help you unwind and find that calm, ready for bed. 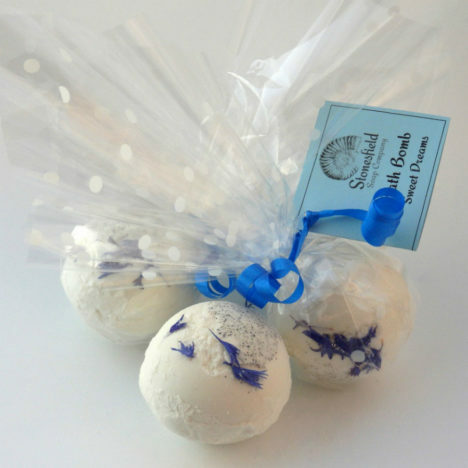 To our classic bath bomb mix, we add sweet almond oil, cocoa butter and shea butter to condition the skin, along with delicious blend of essential oils – lavender, chamomile, cedarwood and clary sage – all finished with a sprinkling of vanilla seeds and a scattering of home-grown, pesticide-free cornflower petals. Price is for one bomb, cellophane-wrapped and finished with a ribbon. We love this bar! As well as nearly 60% extra virgin olive oil, this also boasts lots of shea butter, cold pressed hemp oil, organic avocado oil and wheatgerm oil. Swirled into all that are powdered kelp and spirulina, green tea, aloe vera, Tussah silk, kaolin, Illite and Rhassoul clays, Dead Sea mud, Dead Sea salt, Himalayan pink salt, coarse sea salt and goat milk yogurt. The uplifting aroma comes from a delicious essential oil blend that includes lemongrass, rosemary, cedarwood and maychang and the inclusion of sea salt provides a mild exfoliating effect. Who needs to go to a spa when the spa can come to you? There are two options for packaging. Please choose from: Basic packaging: The soap bar has a cigar band label with full ingredient details and is packed in a compostable glassine bag Gift box packaging: The soap bar is wrapped in a translucent vellum sleeve with a handmade paper band and tied with a fine satin ribbon. It nestles in fine ivory shredded paper in our bespoke ivory ribbon-pull matchbox-style gift box. Except for the ribbon, all packaging is recyclable. Price is for one bar, 95g approx / naked bar. Packaged product weights (NB these weights are an approximation only) Basic packaging - 95g approx Gift box packaging - 120g approx. Please note: as this is a handmade product there will be slight variations between individual bars and different batches; generally speaking, no two bars are exactly the same. The product image displayed is only an example of the design. 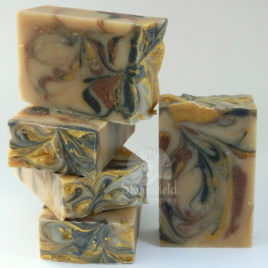 'Bergander Peacock' - soothing and conditioning goat and coconut milks, luxurious tussah silk, shea butter and sesame seed oil, gently fragranced with bergamot, lavender, orange and frankincense essential oils. The price stated above is for a single bar of soap. 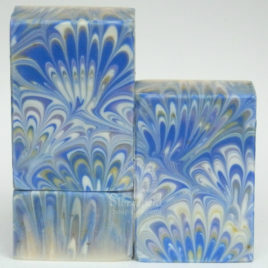 The design will vary slightly from soap to soap. Frankincense and myrrh were burnt to honour Ra, the Ancient Egyptian sun-god. The rich, exotic spicy-wood mixture of essential oils in our signature blend will help conjure up the mysteries of Ancient Egypt: frankincense, myrrh, cinnamon, sandalwood, bergamot, combine with other essential oils to produce our signature blend. 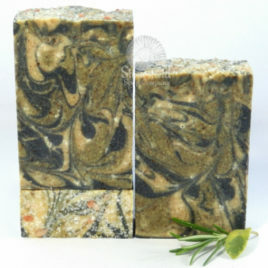 With skin-loving oils of olive, sunflower, coconut and sesame, as well as cocoa and shea butters, coconut milk, goat milk yogurt, tussah silk, and colour provided by charcoal, turmeric, red sandalwood powder, Australian red reef clay, cocoa powder, and, of course, gold mica, this will transport you to the mystic East. There are two options for packaging. 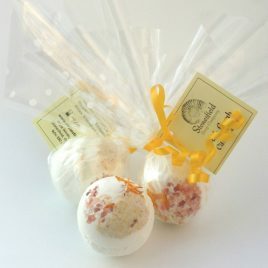 Please choose from: Basic packaging: The soap bar has a cigar band label with full ingredient details and is packed in a compostable glassine bag Gift box packaging: The soap bar is wrapped in a translucent vellum sleeve with a handmade paper band and tied with a fine satin ribbon. It nestles in fine ivory shredded paper in our bespoke ivory ribbon-pull matchbox-style gift box. Except for the ribbon, all packaging is recyclable.